The next upcoming Halloween is on Thursday October 31st, 2019. Halloween is celebrated yearly on October 31, the eve of the Western Christian feast of All Hallows' Day or more commonly known as All Saints' Day. It is also known as Allhalloween, All Hallows' Eve, or All Saints' Day Eve. Halloween is celebrated amongst family, friends, and local communities. 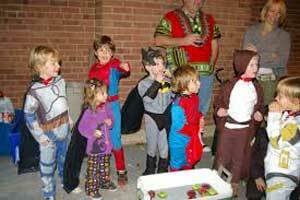 Children dress up in costumes and go trick-or-treating in their local neighborhood or community. Each house gives out candy or a "treat" to the child. If no treat is calendar, then a "trick" is imposed on the house, but no tricks are played out as it is all in good fun. Other activities include carving pumpkins into jack-o'-lanterns, visiting haunted houses, attending costume parties, bobbing for apples, listening to scary music and watching horror films. Halloween starts the triduum of Allhallowtide, the time dedicated in remembering the dead including the martyrs, saints (hallow), and departed believers. The traditional focus involves the use of humor and ridicule to deal with the power of death. All Hallows' Eve is influenced by Celtic harvest festivals as a Christian feast. Commercialization started in the 1900s with costumes appearing in the 1930s and 'trick-or-treating' in the 1950s.